When the news broke in February that the West’s largest coal plant, located on Navajo land near Page, Arizona, was slated to close in 2019, years earlier than expected, environmentalists celebrated. But Navajo leaders scrambled to work out a deal to keep the plant open — arguing it employed hundreds of Navajo members and bolstered the tribal and state economy. On March 1, the Department of Interior invited Navajo Generating Station (NGS) stakeholders, including representatives from the Navajo tribe, the nearby Hopi tribe, the plant’s co-owner Salt River Project, Arizona utilities, and affected counties to a meeting in Washington to talk about the potential closure. “All the stakeholders that were impacted in one way or another were there,” said Navajo Nation Speaker LoRenzo Bates following the meeting. However, a coalition of Navajo environmental groups argued they were stakeholders also but were not invited to the meeting. “We are Navajo Nation public interest conservation organizations that have worked on issues related to the Navajo Generating Station and (Kayenta) Mine for over three decades. Our members include Navajo Nation citizens living near the power plant and/or mine,” said a press release by Dine’ CARE, To’ Nizhoni Ani, and Black Mesa Water Coalition. “Our members are directly affected by the operation of the plant and/or the mine, by the detrimental environmental impacts on our local water resources, and by significantly increasing health disparities in our community,” the groups said. They called on the DOI to be inclusive of all stakeholders — not just those in favor of keeping the plant online — and requested to be invited to participate in all future stakeholder meetings regarding the 2,250 megawatt NGS. The meeting with the DOI appeared to be focused on finding a way to keep NGS open, and part of what they discussed was “what needed to take place to get a lease extension” on NGS, Bates said. “We can’t let this become yet another story of industry in America leaving tribal communities high and dry after decades of exploitation." NGS and its affiliated mine — which straddles Navajo and Hopi land — offer some of the best-paying jobs on the reservations for tribal members. Meanwhile, unemployment on the two reservations hovers around 50%. A closure of the NGS and Kayenta Mine would mean hundreds would be looking for jobs, and may have to make the difficult choice to leave the reservation. The Navajo Nation will have to do a lot more than it is currently in order to create opportunities that allow former NGS workers to stay and work on the reservation. The situation represents one of the main challenges of creating a clean economy on a global level — ensuring a just transition for workers in the fossil fuel industry. Social and environmental justice activists say these workers must be given the opportunity to transition into the clean economy. In Arizona, Navajo and Hopi governments must find a way to offer job training and economic development assistance when NGS closes, the environmental groups said. “We can’t let this become yet another story of industry in America leaving tribal communities high and dry after decades of exploitation,” Nicole Horseherder of To’ Nizhoni Ani said in the release. The plant is owned by four utilities and the U.S. Bureau of Reclamation. The utilities want to close NGS because other sources of power, like natural gas, have become cheaper than coal. The plant’s lease ends in 2019, and needs to find new owners in order to stay online. There are over 3,000 jobs connected to NGS and the Kayenta Mine that supplies it with coal. “That in itself has to raise eyebrows when there’s no other viable economic development within that area to substitute the lost revenue and lost jobs,” Bates said. “For Interior, we are mindful of our Indian Trust relationships to the Navajo and Hopi people and the hundreds of well-paying Navajo and Hopi jobs at NGS and the Kayenta Mine,” Cason said in a press release. Cason added that the Interior would continue to facilitate these discussions, and that stakeholders associated with NGS would look into options for a post-2019 operation. Bates said the DOI gave various stakeholders assignments which he couldn’t go into detail about - and that they were to return to Washington in mid-April to bring the results. In the meantime, employees at NGS braced for the possibility of losing their livelihoods. Lorinda Bennett said she worried her children and grandchildren would move away looking for new jobs once the plant closed, NPR reported. “Our kids are going to move away and our grandkids. That’s what they’re planning on,” Bennett said. “They’re already looking for another job,” Bennett said. Hopi Chairman Herman Honanie was also at the meeting this month with the DOI and other NGS stakeholders, AZ Central reported. Honanie hopes to keep the mine open — although he says about half of the tribe would like to close the mine because of environmental concerns. While the Navajo Nation has other sources of revenue, including casinos, the vast majority of the Hopi Tribe’s revenue comes from mining activities. Honanie hopes that President Donald Trump — who has vowed to support coal operations across the country — will ease regulations so that coal becomes more competitive and NGS and the mine can stay open. “If we can manage to lobby effectively and bring this attention to their ear, to their minds, and hopefully in some effective unified front between us and Navajo and whomever else, if we can get an audience with them, we hope that they can come to our aid in the best possible way,” Honanie told AZ Central. Far from everyone involved agrees with this sentiment. 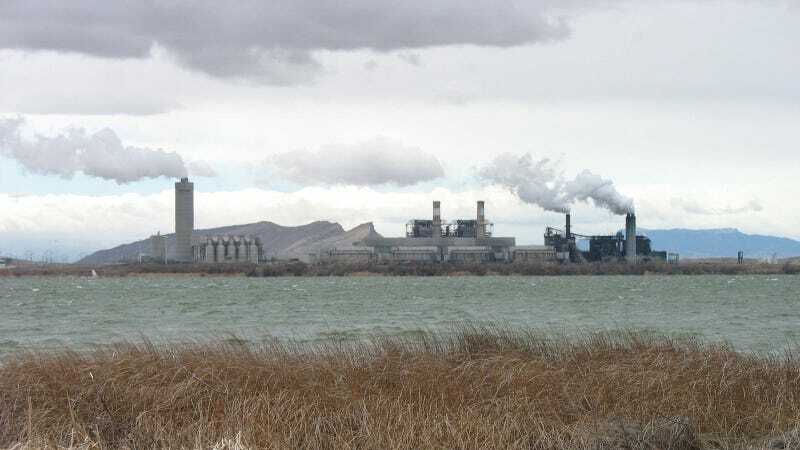 Navajo environmental groups say the emissions from the coal plant increases pulmonary diseases including asthma, and can leave miners with bad health. At the same time, governments around the world are trying to limit carbon emissions that cause climate change — which is why environmentalists from the Navajo Nation and across the country celebrated news of NGS’s closure in February. NGS accounts for nearly 30% of Arizona’s total carbon emissions from energy generation. The 44,000 tons of carbon emitted each day has even been blamed for a haze over the Grand Canyon. What’s more, some say the plant may be fueling a drought in the region; the plant uses 34,100 acre-feet of water per year, according to the DOI. “Today’s announcement that Navajo Generating Station will close in 2019 presents an opportunity both to make amends for decades of pollution and injustice and to map out a far more sustainable future through clean energy,” the coalition of groups representing Navajo communities said in a press release. Navajo residents have had to live with more than just coal emissions over the years. Nearly 30 million tons of uranium were mined from their lands from 1944 to 1986 which caused contamination of structures and water that is still being cleaned up by the EPA today. “We have a responsibility to our future generations to begin a just transition away from fossil fuels now,” said Black Mesa Water Coalition executive director Jihan Gearon in the press release. “We are blessed with some of the best wind and solar energy resources in the world, and these are what will help us build a sound economic foundation that is sustainable, restorative, and just." At the same time, this is also an end to overuse and contamination of water, air pollution, and community health impacts. We have three years to start building a better economy! And so many of us across the rez have been working hard to promote, understand, and remove barriers to a more diverse economy — renewable energy, food sovereignty, watershed and land restoration, wool, and tourism. To that effect, Jared Touchin from the office of Speaker Bates of the Navajo Nation said the Navajo community in Kayenta has a solar project that started over a year ago. Also, when the Navajo Nation created the Navajo Transitional Energy Company (NTEC) a few years ago to be the owner and operator of another mine in New Mexico, it mandated that NTEC would devote 10% of their annual revenue to the development of renewable energy. “That is one example of how the Navajo Nation is working toward renewable energy,” Touchin said. The closure of NGS represents an opportunity to combat global warming, but may leave workers out in the cold.